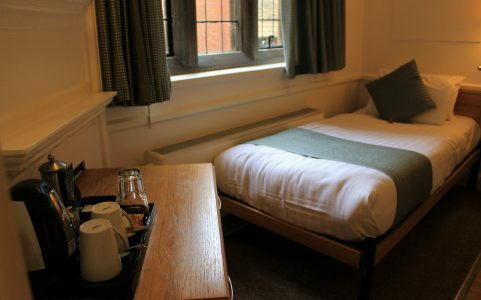 We have a number of different accommodation options and room types suitable for a single night through to a full term. URC members are welcome to join us at any time throughout the year, call us on 01223 330630 (please tell us you are part of the URC). For Student or Sabbatical options please contact the Tutorial Office on 01223 330649. Redeveloped to a high standard in 2014, your overnight accommodation is en-suite with lift access to all floors in the main building. There are tea and coffee facilities in every bedroom and Wi-Fi throughout. Bedrooms are all fitted out with desks and chairs and essentials that you wouldn’t want to bring along, such as a hair dryer and a radio alarm clock. You can enjoy a variety of rooms. We have 2 bedrooms that are fully accessible with automatic doors and large, comfortable wet-rooms. In addition there are 5 doubles, 20 standard singles and 11 suites which include their own kitchenette. In the residential wing there is a coin operated laundry for use by all our guests with irons and an ironing area. For late night snacks or things you may have forgotten to bring we have a vending machine up on the first floor. You might also be interested in our two cottages. These sit in the grounds to the rear of the main building, overlooking our prayer labyrinth and art studio. Each comprises a lounge with a dining area and fitted kitchen, a separate double bedroom and a bathroom. Often sabbatical and longer term visitors enjoy these more secluded homes. To book, call us now on 01223 330630 or email accommodation@westminster.cam.ac.uk. Please do let us know you are URC so we can give you the best available price!